All about pregnancy pillows – do you actually need it? Chunky knit wool blankets for babies – yes or no? Pregnancy is definitely a time when you need to be comfortable all the time. Although on Instagram we see all those pregnant girls rocking their high heels, tight clothes and other stuff, usually it’s just for photos. In real life comfort is way more important in that time. Talking about comfort, you would assume that laying in bed would be the best choice, right? Well for most of pregnant women it’s the opposite. That big baby bump is a real challenge, because finding the right position and support might be impossible. If you like me, and sleeping is becoming more and more uncomfortable, pregnancy pillow is something you just need to try out. At first I was a little skeptical about it. I thought that this was just another product for pregnant ladies, that would buy just everything to feel rested. But actually it was a pleasant surprise when I git first amazing night sleep in a very long time. We all know, that being pregnant is a really difficult job. Most of us always feel tired, so good night sleep or even naps during the day are the way to go. 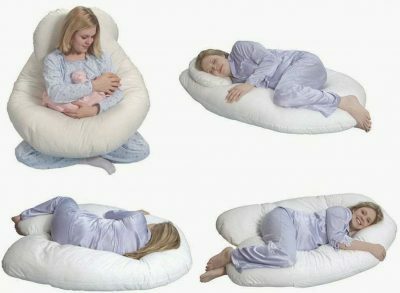 In my case pregnancy pillow was a true life saver, I just wish I have bought is earlier. Maybe others think that nursing pillows are not that necessary, but I couldn’t disagree more. As I first time mom, I didn’t really know what is the right way to hold baby while breastfeeding. It might seem easy, but when you’re stressed, in a lot of pain and dealing with that tiny little human being, you can use all the help in the world. Breastfeeding is hard enough itself, so nursing pillow will make things easier, believe me I know. I used it for feedings until my baby was 9 months old, so I think it was worth every penny that I spent. I hope this post was informative and will help you to decide on wether to purchase it or not. If you have any experience with these pillows, leave your thoughts in the comment section. I would love to hear from you! Can this pillow be used to brestfeeding too?